Kentucky’s ONLY petting zoo and mini golf ag-venture – all in one! Visit Christian Way Farm & Mini Golf to spend a relaxing day outdoors. Feed and pet farm animals from corn you grind yourself, play a round of farm-themed mini golf, take a ride on the lawnmower train, play in the corn truck (it’s the corn equivalent of a giant sandbox! ), or simply enjoy the wide open spaces to run and play. Christian Way Farm and Mini Golf features hayrides, a playground, Gaga ball, a tricycle (hay!) arena for friendly competitions, giant Scrabble & giant Jenga. For the historian or farm equipment aficionado, come learn about equipment that dates back to the early 1900’s. In the Spring, you’ll have the chance to meet new farm animal babies! In the Fall, enjoy a pick-your-own pumpkin patch and Fall activities like our corn maze. Have a picnic or enjoy pizza and wings from the Christian Way Cafe. Shop the country store for toys and unique gifts. Christian Way Farm is intended to be a place to enjoy the outdoors and participate in fun farm activities. We look forward to seeing you! Upon arrival make your way to our store–inside an old tobacco barn. You will find snacks and drinks for sale as well as an assortment of gift items. Pay your admission and our staff will be glad to assist you as you start your visit to the farm. Fall activities typically start the Saturday after Labor Day. That means our hayrides are available throughout our day time hours to take you to the corn mazes and U-pick pumpkin patch. You may pick and purchase from the selection of standard orange or decorative pumpkins. The haycastle is the other added bonus to fall time activities. Young and old alike can ride. You just have to wait your turn! Take a turn at the wheel as you are guided around the farm on our lawnmower train – a Christian Way Farm favorite! The animals on the farm are always changing–new babies and new animals make each visit fun–looking for your favorites from previous visits and hunting for who is new! At the corn crib you can shell and grind corn to feed the animals. Lots of animals to feed and lots of people to feed them. No trip to the farm is complete without playtime—corn trucks, lawnmower train, hay castle (fall only), tricycle track, giant Jenga and giant Scrabble, Gaga ball, playground and plenty of open space for free play. The corn truck will be available for children to play in like a giant sandbox. What’s a little fun without games? 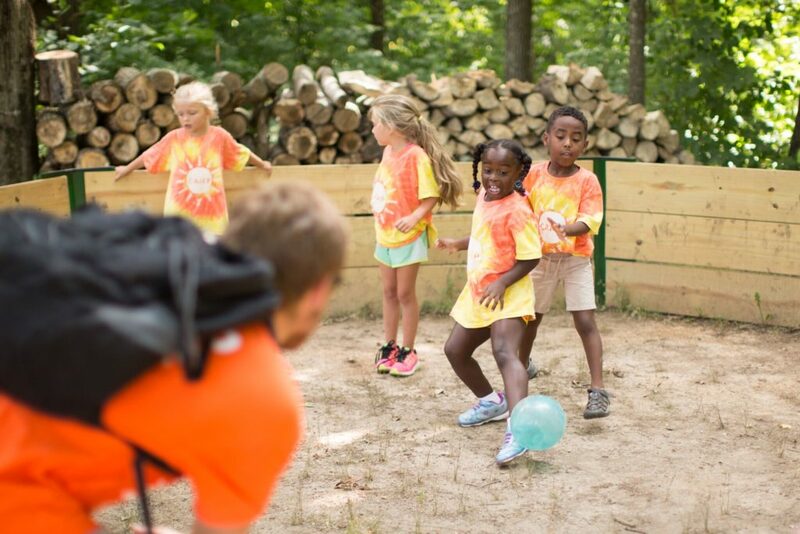 Whether it’s a race around the tricycle track, a friendly game of giant Jenga and giant Scrabble, or a game of Gaga ball, there’s competition to be had outside the mini golf course right on the farm! We are glad for you you to bring a picnic if you would like to bring food to the farm (no alcohol permitted). We have designated picnic areas for you and your family. New to the farm in August 2017, we now offer a menu of pizza, wings, burgers, hotdogs and much more. Check out the Menu page for menu items available.